Countdown to Christmas Giveaway: Books, Books and More Books! This post contains affiliate links. Thank you for supporting Made to Mother! Welcome to M2M’s Season of Giving: Count Down to Christmas Giveaway! Just one more week until the big, blog redesign giveaway package on December 15th to celebrate Made to Mother’s 1st “blog-iversary!” Last week’s highlighted products were the ebooks, OhAmanda’s Truth in the Tinsel and Sarah Mae’s More Than Candy. This Grandma isn’t like other grandmas, she’s CRAZY! She zip lines through the jungles of Borneo, leads conga lines at weddings, and drives a sports car. And that’s not the half of it! 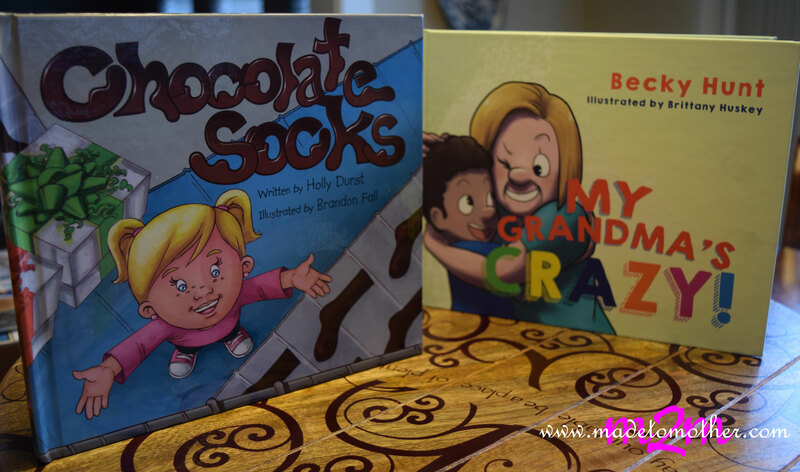 Encouraging children to follow their dreams and not to be afraid to create new things, the author took her two favorite things, chocolate and socks and turned it into a fun adventure for a child. The Old Testament story of Ruth is full of collision—loss, heartache, poverty, even shame—but she never let her past define her. Instead, the most painful time of her life became her most pivotal, propelling her to a destiny she never imagined. See my review of this book below. Beginning with the books of Psalms, Proverbs, Song of Songs, Luke & Acts, John, Letters from Heaven (Galatians, Ephesians, Philippians, Colossians, and 1 & 2 Timothy), and Hebrews & James, this translation is designed to shape the spirituality of a generation. Every book of the Bible is translated into an understandable form that will express the depths of the original languages in a powerful new way, revealing the original emotion behind the text. Provides lists of valuable pantry, fridge and freezer items helpful for maintaining a healthy lifestyle. Also includes important conversion charts and offers clean substitutes for some popular unhealthy foods, making the jump to clean eating as simple as possible. Ambassador works with authors to create quality Christian literature of several genres—fiction, devotionals and children’s books just to name a few. Founded in 1980, Ambassador International’s vision has always been to create products that strengthen believers in their Christian walk and direct the lost to the way of salvation. Ambassador International releases more and more new titles each year including both print and ebook formats. Ambassador operates offices in the US and Northern Ireland, holds distribution partnerships on four continents and our books are in the hands of readers around the world. You can find out more information about them at Ambassador-International.com or follow them on Twitter and Facebook. Icon Media Group is a boutique firm run by a team of talented individuals who excel at media relations, strategy, public relations, branding and niche marketing. Partnering with publishers, record labels, distribution companies, retailers, film companies, authors, artists and newsmakers in many different capacities, Icon publicists have collectively produced national and local media tours and coordinated hundreds of events. Over the years they have booked clients on network television programs like Good Morning America, TODAY, CBS This Morning, NIGHTLINE, and programs on cable networks including CNN, Fox News Channel, Fox Business Network, MSNBC, Comedy Central, HLN, and other regional and local television shows. Print hits have included USA TODAY, Washington Times, Washington Post, Atlanta Journal-Constitution, Dallas Morning News, People and Wall Street Journal. Colliding with Destiny: Finding Hope in the Legacy of Ruth by Sarah Jakes and published by Bethany House was an amazing read. For me it was like a cross between a powerful devotional study on the book of Ruth and having a long, heartfelt conversation with my best friend. Seriously. In short chapters digesting a few verses of Ruth at a time and including a lot of personal narrative and examples, Sarah Jakes’s words spoke to my soul, encouraging me to accept the seasons of my life in stride, be free from mistakes of the past and let go of relationships as we grow our separate ways. She wrote about the wisdom of saying no at God’s urging and giving my time to Him instead of becoming a “Jill-0f-all-trades and master of none.” I felt renewed through reading this to run the race that God has set out for ME and not to fret my mistakes and my sinful past because, “that’s the beauty of restoration- He uses what we give Him to create something divine.” And I was encouraged to be patient as I wait for the future plans he has for me, knowing that He is preparing me for what is to come and while I may feel a bit impatient waiting, it will be worth it. Finally, Sarah Jakes reminded me that I do not have to explain myself to others, that my worth is not measured in what they think of me, my accomplishments or my past. Being confident and valuable to myself is enough and that will shine. And even if my biggest dreams are not realized, it is enough that God and I know that I am being the best me I can be! Which, as Sarah Jakes so eloquently put it, “is the perfect canvas of grace.” If you cannot tell already by the Post-It flags in the pic below, I loved this book! Don’t forget to stop by next week and see the launch of M2M’s new design in honor of its first “blog-iversary” and enter the giveaway package, featuring even more cool things! Want a hint? Some swag and spending cash from two of my favorite online retailers, Mary&Martha and the Root Collective and more! All opinions are my own and aside from being given one copy of Colliding with Destiny, I received no compensation in exchange for writing this.